RMT cleaners, security staff and travel safe officers on Docklands Light Railway will be taking part in a further phase of strike action over a comprehensive breakdown in industrial relations, the union confirmed today, as the intransigent attitude of the management continues to refuse to meet and negotiate a settlement. We note the report from our Lead Officer; and that a meeting is taking place today between our negotiations team and the company. We instruct the General Secretary to obtain a further report asap from the Lead Officer and place it before this NEC. cleaning grades in line with the resolution. Bakerloo News is the newsletter for Bakerloo Line workers from the RMT Bakerloo branch acxtivists. This afternoon we met with the Deputy Mayor of London. The Deputy Mayor has advised me that the removal of contractual sick pay for the ex Vinci TUPED into ABM cleaners ( who had been in receipt of it before the TUPE) has been reversed. This clear injustice has been rectified by the determined effort and activities of the RMT. We now of course will redouble our efforts and continue the fight for all ABM cleaners to recieve proper Sick pay / Travel benefits / better pensions and pay as well as justice at work. 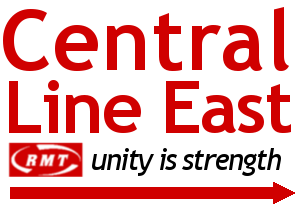 Jubilee South News is the newsletter for workers on the Jubilee Line between Stratford and Westminster, including stations, trains, cleaners, canteen workers and SMD control. Does driving on the Jubilee Line damage our hearing? Overtime - a curious case of who pays?